Madworld Haunted House is a Haunted Attraction located in Piedmont, SC. Team Jefferson Starship reviewed this Haunted Attraction on October 5, 2018. 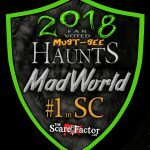 With its massive and detailed façade visible from I-85 in South Carolina, MadWorld Haunted Attraction is a feast for the eyes. Pyrotechnics lead you through a massive gate and into a high-energy monster-filled midway with photo ops, movies, music, behind-the-scenes videos, and concessions that allow for s’more roasting or shaved ice, depending on the night’s temperature and your temperament. From the highly-detailed and impressively-skilled terrors crawling, stomping, and skipping their way along the length of it to the sounds of screams drifting out of the woods and through the darkness, there is a ton to see at MadWorld long before you even enter the haunt. Tickets are broken into regular admission, the highly-advisable fast pass, season passes with backstage VIP access and swag, and specialty entrance with markings to let monsters know, as much as you want to see them, you don’t want to be scared, which protects both the less-brave of your group and younger members that want to come along. Enhanced ticketing options allow even the most easily frightened of your group to enjoy the haunt from start to finish! Sets are detailed, makeup and masks are carefully applied, and horrors are abound from recent pop culture to ancient history. With impeccable customer service, well-executed special effects, and passionate monsters, Madworld is not to be missed! From the moment we entered Madworld’s giant arch, it was obvious that the monsters here love what they do and are well trained to scare everyone from the casual visitor to the stoic and experienced veteran. Many of the characters had answers for our questions, capable of both bantering and keeping our group moving along without breaking character. Gunther gets a loud shout-out here for his ability to handle Doug smoothly, as even those of us who have known him for decades are incapable of handling that task some days. At the entrance, Sven and his nightmarish supervisor made sure to give the rules in character with a tinge of dark humor added to the mix. From there, we were inundated with about 165 gruesome souls that ran the gamut of hapless victims to maniacal voodoo practitioners. Horror movie monsters, including Derry’s most infamous clown and famous fictional children dragging their waterlogged corpses from wells and sewers, hid around corners or crawled through darkness to reach out for us. Make sure to watch out for the world’s most dangerous grandma and stop for a bite in Cletus’ diner before dashing through corn that hides more than a few secrets and past shadows that slide through the sky reaching down for you. Madworld employs a number of costuming techniques to enhance their menagerie of monsters and villains. From original characters dressed to the nines like Grandma or Gunther to lovingly-recreated movie characters like Georgie and the Nun, details are a big part of Madworld’s focus. There are no untucked masks, dangling prosthetics, or simple blood splatters to be found on characters here. Equally impressive for us was the focus the staff put on the actors that you barely see, or don’t see at all. Shadow monsters had blackout makeup under their masks that made sure that they were effective in their ambushes on upcoming groups. It’s hard to beat the level of attention Madworld has put into its customer service. 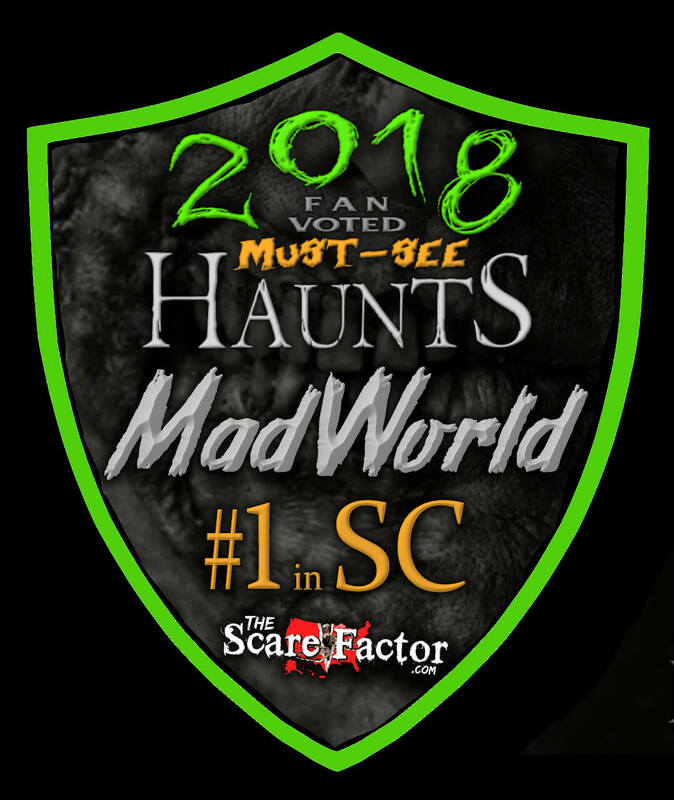 On top of offering multiple levels of admission with a focus on making sure that the haunt is accessible to visitors from every spectrum of bravery and experience, Madworld has an easy online ticketing system and discounts for on-site tickets bought. The customer service manager, Taylor, is attentive and busy, working her way through the crowd all night to check in on visitors and make sure that feedback is positive and everyone is having a good time. Their social media manager is very engaged as well, and both ladies work hard to balance makeup duties and customers’ needs. Employees are clearly marked by haunt shirts and they all have headsets to facilitate communication and care for their customers. It’s remarkable how busy their team is, keeping the haunt flowing properly, and making sure that everyone is happy. On top of that, wait times are clearly marked and updated on a digital sign so that warning is given if upgrading to a fast pass is vital. The parking lot is split for both car size and drop-off and pick-up zones. Every parking lot is well-lit and -staffed to make sure the process is smooth, easy, and safe. The Madworld staff has the same enthusiasm for every patron, and that’s truly inspiring. The atmosphere at Madworld is one of a Halloween carnival. Energy is high starting at the entrance and moving through the entire trail. With multiple photo booth setups, an enormous and impressive facade, and a ton of queue entertainment, there are no dull spots within the grounds of Madworld. Doll Face and Gunther were making the rounds upon our entrance leaving screams and terror in their wake. A tall monstrosity lumbered about the parking lot setting the tone for what was to come next, and a magnificent ogre dragged about on chains by long-suffering monster attendants stomped past us towering above the crowd. Later in special effects we’ll go into more detail, but let it be said that the atmosphere at Madworld is, at times, incredibly interactive in a way that is truly unique in the area. With the levels of attention that are spent on making sure that every customer is happy, this also ensures that there is a constant flow of both monsters and regular staff members keeping everything running smoothly and bringing the feeling of Halloween to the forefront of everyone’s mind. With loops, twists, and turns prevalent throughout the trail, you often find yourself thinking you’ll be turning back to a known area only to be surprised by a new structure or sight built into the geography of Madworld’s haunt. The architects of this trail know how to build facades, set pieces, and looming structures that fit perfectly into the structure of the nightmare and take you further out of the world of the mundane and real. Our group was particularly taken back by a skull that seemed to float in the pitch darkness of the woods and a clown entrance that stepped out of the ordinary – and into the extraordinary – by making several uncommon choices for style and aesthetics. Madworld’s strength when it comes to special effects is their ability to take uncommon approaches to easily-recognizable themes. For every movie monster you recognize, the choice of set build, sound effects utilized, and focus makes it so that you are experiencing the whole thing again for the first time. Madworld is an ultrasensory haunt, turning your ears, your eyes, and even your nose against you. Through intensely-clever and brutally-thorough applications and mixtures of scents, Cletus’ Diner has set a bar for our team reviewing cannibal cafes that cannot (and hopefully will not) be reached for realism and visceral power. In the voodoo room clever usage of set building is enhanced by a careful application of light to trick and betray your judgement about the structure of the upcoming sections of the haunt. Even at the very beginning of their haunt, after the introductions given by the team in the hospital’s waiting room, special effects are utilized to turn your senses against you and enhance the horror woven into Madworld’s experience. Madworld is a mixture of modern horror movies, original characters, and classic horror themes. Patrons should expect to see creatures from all time periods and genres of horror including original creepers like Gunther and modern movie monsters like Pennywise the Dancing Clown. Madworld touches on each of these types and time periods of horror to better reflect its diverse customer base’s fears. With such a wide variety of subjects, Madworld is able to boast having something to scare every member of your party. No fear is left unfounded as patrons scream their way through the woods looking to just reach the exit and get back to the relative safety of their car. Screams can be heard from the woods as early as entering the parking lot, but throughout the night, you can see people running and screaming from the creatures of Madworld. A short period of time spent near the fire pit allowed our team to see group after group fleeing from the show’s finale in terror. Even more impressive was the number of people dragging their unwilling significant others deeper and deeper into the midway with gleeful smiles on their face. 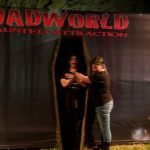 With the no-scare ticket options obviously, this will be less intense, but if you and your group are looking to be scared, Madworld is certainly capable of offering each of you a scare or two or twenty. From the well-placed and sneaky scares of the corn field set to the unexpected nun prayer circle, there was seemingly no end to the constant screaming of patrons. Madworld offers a variety of ticketing options for different types of customers, and a lot of bang for any of those bucks. On top of allowing patrons to decide how long they want to wait, whether or not they want monsters to approach them, and how many times they want access to the haunt during the season, there are a variety of options for how much money you can spend at Madworld. Our team has been many years in a row and we highly recommend at the very least the fast pass. Madworld has built a customer base too hungry and devoted to be able to enter and exit easily. Slow nights are not a common problem and it’s well worth it to get through the haunt a little earlier so you can spend more time in the midway!